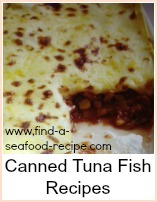 A couple of tuna fish casserole recipes - which can be prepared quickly out of storecupboard ingredients. The first one is great for making when you're on holiday too - just put everything into a casserole dish, into the oven and you've got just enough time to get the kids showered after a day out at the beach. While the macaroni is cooking - just al dente as it will get further cooking in the casserole, combine the rest of the ingredients. Heat the soup with the milk, onion and a dash of pepper. Mix the macaroni into the soup mixture. Add the mushrooms - slice them into chunks if they're whole. 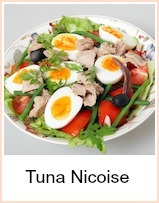 Drain and break up the tuna and mix together. Sprinkle generously with grated Parmesan, cheddar cheese or a combination. Bake at 350 degrees F. for 25-30 minutes uncovered. As you see from the list of ingredients - it is something you could use as a store cupboard standby or pack for your holidays. I like to take at least three main meals with me when I go away as it means I can spread the cost and the holiday spending money will go a bit further if we eat in a few times. You could add some frozen veg to this - maybe two cans of soup if you're going to add a lot more - but it's great to mop up with crusty bread. You could easily prepare this earlier in the day - it would need longer in the oven then to heat through properly - say about 45 minutes. Boil and drain the pasta. as above, al dente - use twists, macaroni, shells - any smallish shape you prefer. Heat the oil and gently fry the onion and pepper until soft. Add the tomato soup and milk, bring up to a simmer. Add the tuna to the sauce. Put the macaroni in a baking dish, then pour the sauce over and mix it all thoroughly so that the sauce coats the pasta. 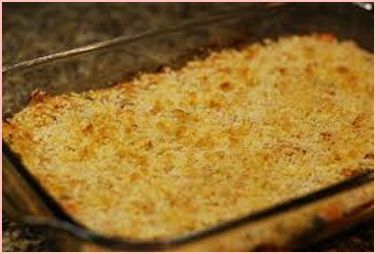 Mix the breadcrumbs and cheese together and scatter over the top, making sure that it is all covered. You will get a lovely crusty top and the pasta will remain moist. Cook for around 25 minutes in a medium oven - 325F, 170C Gas Mark 4. If you've enjoyed these tuna fish casserole recipes, here are a few more storecupboard standbys that are always useful - when you haven't had time to shop and everybody's starving - these are quicker and cheaper than getting a take away! 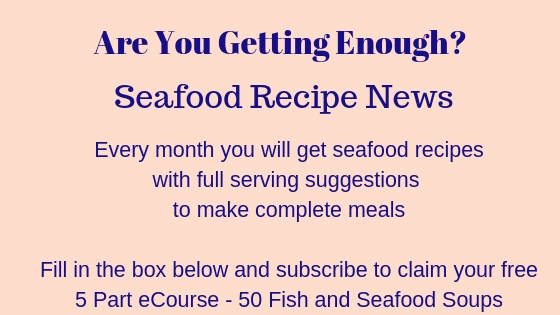 Super simple tuna fish casseroles that you can prepare ahead and cook when you're ready. 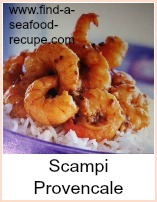 Great for a quick tea that you can make out of store cupboard ingredients.